This is a continuation of the previous thread which was getting crowded. Post any deals you find, recommendations, requests for deals, etc. Please keep things as civil as possible. There's no such thing as a bad deal post and reviews are opinions. Code drops are allowed in this thread. I just ask that you state that you have a code available and let the interested parties send you a pm to obtain it. If you want to check out a particular game, try the following review sites, or ask in here so fellow CAG's can assist you. Apple Game Center allows you to keep a friends list, track your in game achievements, and compare with your friends. Many games support this. Make sure to checkout the official CAG Game Center Exchange Thread. You can post your game center name and see the names of your favorite CAG'rs. 1. Make sure to check for periodic updates either in iTunes or on your iOS devices. For each release of new firmware, there's usually a bunch of games updated right afterward. 2. Some applications also go on sale by their authors when they reach 1 million download and similar milestones. 3. Apps often have specials the day before, during, and after holidays, regardless if said game/app is related to the holiday. Most notably is the fact that many developers discount their apps for Christmas and because Apple employees, in charge of App Store changes, take a break during the week of Christmas these discounts usually last until the new year. 4. Newly released apps will often have a % or dollar amount off for a limited period of time to gain a large following quicker. While browsing the app store you can go to a particular type or genre and order according to release date. This can make finding new app discounts faster. 5. Apps can be re-downloaded from your iOS device. To do this open the App Store and look for a tab called "Purchased". From here you can re-download any previously purchased apps. 6. I strongly advise not to buy iTunes Gift Cards by 3rd parties unless you know they can be trusted. Retail stores and receiving cards as gifts are the best ways. There are many credit card scams, stolen cards, hacked cards going around, especially on Ebay. 7. If you are the victim of a iTunes Card scam or get your account locked due to one not all hope is lost. Apple has been fairly lenient on these issues. Call Apple directly at 1-800-MY-APPLE or check the iTunes Store support page. Also going to your local Apple Store to discuss it can help. The account locking is an automated process and can be reversed. This can take time so be cautious if you use gift cards from 3rd party sources. 8. If you somehow break your iOS device, you have some options. If you bought the Applecare warranty it should be covered for most items. If your Applecare ran out or you don't have one, try using one of the repair guides on iFixit to repair it yourself. Apple Stores have been known to give discounts if you bring in a iOS device that they will not fix since it's not in warranty. This discount however is very small. 9. Using a screen protector can extend the life of your device. Most stores carry these, but they can be hard to install. The best I have personally used are made by a company called Power Support. They have both clear and anti-glare protectors. They are easier to install because the protector is a firm yet thin piece of plastic. Griffin Technologies and Zagg are also very good. 10. Universal Apps have a small plus sign in the upper left corner next to their price. They can be played natively on both the iPad and iPod/iPhone. iPhone games that are not universal can still be played on the iPad with a lower resolution. Non universal iPad games cannot be played on the iPhone. Feel free to add games, genres or move titles as needed. This list is to give CAGs a chance to catch up on high-quality games they may have missed and to get new users started on "can't miss" titles to download for their new iDevice. Green titles are universal (ipad and iphone/ipod touch). ^ are retina optimized for the iPad. * are iPhone 5/5th gen iPod Touch optimized. ~ (symbol beside the "1" on standard US keyboards) are iPhone 6/6+ optimized. Note that apps that are iPhone 6/6+ optimized are by default iPhone 5/5th gen iPod Touch optimized. Some game developers/companies like to offer free versions which are usually demos of the full version and a great way to check out and determine if you will actually like a particular game without paying anything. These demos are noted as such. Some game developers/companies like Zynga, however, like to offer free, AD-Supported, versions of their games which means you get the full game, but it features ads and by buying the paid version you remove those ads. AD-Supported games are noted as such. Tagging thread to make sure I can follow it later. Man I love iOS. I really hope the next iPhone steps it up a lot. I really don't want to have to start over again but there are so many features we are missing out on that there just is no excuse for anymore. Its got that new thread smell, thanks OP! Thanks for the refresh, but I think wiki status is broken, :(. I was hoping to add some of the more recent titles to the list, but I guess that won't be happening, :/. Were Hero of Sparta 1 and 2 removed? I happened to have 1 saved on my Ipod Touch and finally after years got around to playing it, when I finished I looked for the second one but with no luck. It seems like every other gameloft game is still available, even most licensed ones that are old, is it just me or any help would be great, are there codes around like with XBLA where I might still be able to play the second one? Letters from Nowhere is free at the moment, it's a seek-and-find from G5. It's not great but it's free so it's hard to argue with! What features are referring to? I'm curious as well. I used to be an adopter on the non-lettered upgrade cycles. However, unless there's something really impressive on the horizon, I'll be sticking with my 5 until I can't upgrade the software anymore. Callys Caves 2 is a neat looking "Metroidvania" game with a female protagonist, promised difficulty, and the price tag of free. I haven't tried it out, but look forward to doing so. Callys caves 2 looks awesome thx Lee! Agreed. Terrible name, but everything else looks cool. Hope it's good, for all our sakes. Not that it's a big memory crunch if it isn't. Honestly, I found out about it through Wario64's Twitter. 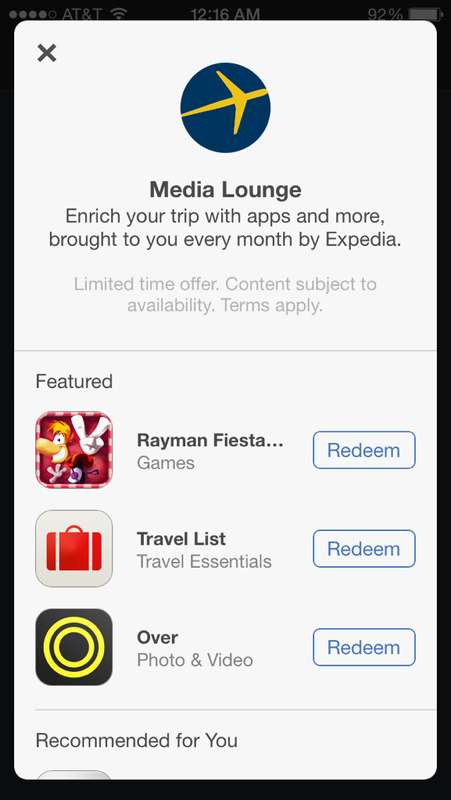 Rayman Fiesta Run is FREE via the Expedia App. Click on "Trip", and then "Extra" to redeem the game. Credit goes to nim397 @ SD. Now the question is whether it's worth downloading the Expedia app? I have 2 Expedia-bought flights upcoming and don't yet own Rayman Fiesta Run. Double win! It's not on sale or anything, but if you've ever seriously wanted to learn Japanese, the app Human Japanese is awesome. I've been using it daily for almost a year now, after casually toying with it. It's really great. I'm about 15 chapters into the Intermediate sequel and I know an amazing amount, learned the proper way. About 6 months ago, they updated it to add points for correct answers and leveling up. I especially recommend it for iPad.